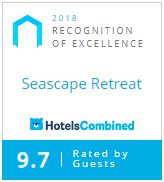 Seascape Retreat provides 5 star nature based boutique accommodation in three fully self-contained bespoke villas at Hindmarsh Valley, Victor Harbor, a leisurely one hour scenic drive south of Adelaide. Nestled on 75 picturesque gum studded acres in the hills above Victor Harbor and Port Elliot, all villas have stunning elevated views down the valley to the Southern Ocean. Each villa is different in size, layout and decor but all are very spacious and fitted out with everything you require for a luxurious stay. They feature an open plan living area, a spacious bedroom with king bed, large bathroom with walk- in rainwater shower and a fully equipped modern kitchen. For more information visit our 'Accommodation' page. Seascape Retreat provides an unsurpassed eco accommodation experience on the Fleurieu Peninsula, designed to be a sanctuary of comfort and style where you can relax and unwind in complete privacy. You can choose to simply stay in, indulge and relax, or venture out to explore the region with its world-class wineries, stunning beaches, farm gate producers, cafes and restaurants. SO WHY NOT SPOIL YOURSELF AND EXPERIENCE THE PEACE, PRIVACY AND COMFORT IN SPECTACULAR NATURAL SURROUNDINGS AT SEASCAPE RETREAT?